To do this, though, I need to go back to simpler times, the days before Internet, Google and our capacity to source information on just about everything at the touch of a button. When I started out on my journey as a lifelong lover of hard rock and heavy metal I was only in my teens. My points of reference were very limited. My friend’s older brother (we all know one), Sounds magazine and the mighty Kerrang! (when it was good) were all bastions of “good taste”, providing me with precious nuggets of information about what I should be seeking out in terms of new music. But better then even these valuable sources of info was “the specialist record shop”. I’m not referring to Our Price (RIP), or HMV, or Virgin, although these shops stocked good stuff too. I’m speaking of the hard rock/heavy metal specialist, in my case the mighty Shades, a basement hangout tucked away in a small backwater of deepest, darkest Soho in London. Shades was never merely visited. In my teens a trip to Shades was a holy crusade to Hard Rock Mecca. Everything was planned in advance. I had to make sure I had enough money to make the trip worthwhile, as well as my train fare from the Midlands, obviously. And I always took a list– bands mentioned in either Sounds or Kerrang, many with strange names I’d never heard before. I can’t describe the sheer excitement of those days. When I think of Shades I think of posters on the walls, the smell of shrink-wrapped vinyl, the import stickers (which only made the records that much cooler) and the guys working behind the counter who effortlessly threw one great album after another at you. S.T. Records is an awesome throwback to those happy times. I’ve been shopping there for at least 20 years now and in all that time it hasn’t changed a bit. It’s a small space that really reminds me of Shades. The walls are racked out and bursting at the seams with CDs, vinyl, DVDs and Blue-ray, T-shirts, box sets and rarities. “All killer, no filler”, ST Records deals in rock and metal baby (no Beyoncé here), with every genre and sub-genre I could want – and (mostly) in alphabetical order. The guys in the shop are very friendly and approachable. Want to listen to a track from a CD? No problem. They’ll put it on for you. Want a recommendation? No problem. They’re always happy to give you a few pointers or tips. And it’s not just the staff who are there to help. The other customers in the shop are more than happy to engage in conversation. We’re all ‘rock brothers’ and ‘rock sisters’ after all, thrown together by our mutual love of rock and metal music. Yes I can buy almost each and every title from every band on the Internet. Amazon and EBay are also places I visit. But that’s just transactional. I buy my music from them in the same way I buy a tin of beans. Where’s the pleasure in hitting a ‘buy’ button and waiting for DHL to deliver something. S.T. Records is, in its own special way, bringing out the teenage rock music lover in all of us. Remember that feeling in your tummy when you came across a ‘must have’ or that rare gem you never thought you’d find? Well I’ve often experienced that feeling while sifting through the shelves at S.T. Records. And what price would you put on that? If you ever visit the West Midlands make sure you look up S.T. Records. 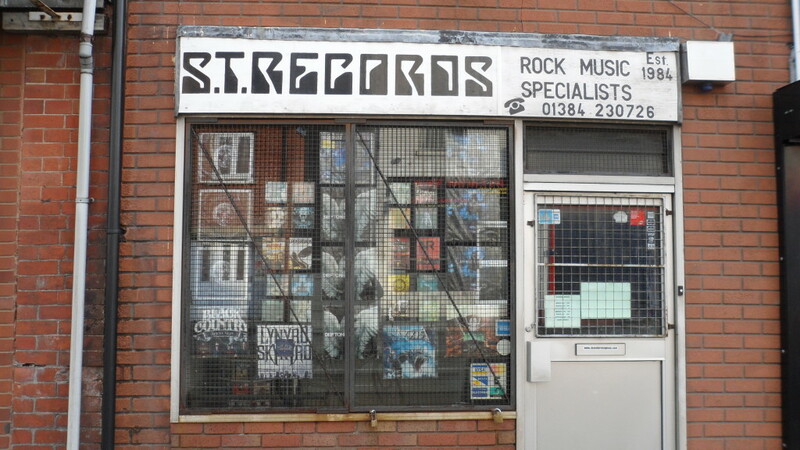 It’s one of the last bastions of specialist music shops covering hard rock and metal. I’m sure it’s one of the oldest too. I guarantee you’ll love the whole experience. When you’ve got a well-stocked rock shop, knowledgeable staff, friendly customers, a great atmosphere and a great second-hand section, how can you possibly go wrong?! Do you know of any other brilliant indie rock record shops? Let’s give them some airtime!